This article about an albino dolphin is relatively old (it's from March 2009), but I still felt it was worth sharing. I had no idea that such dolphins existed. I've reposted the article below and if you want to see the original one by the Daily Mail, just click here. 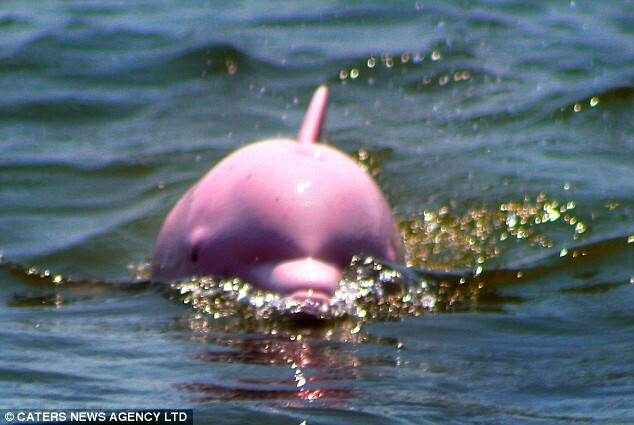 "Caught on camera: Is this the world's only PINK dolphin? These are the stunning pictures of a rare pink bottlenose dolphin spotted swimming in a Louisiana lake. The mammal was pictured by local charter boat captain Erik Rue, who has been studying the dolphin since it first surfaced in Lake Calcasieu, an inland saltwater estuary, north of the Gulf of Mexico in Southwestern USA. Since it was spotted with its pod of normal coloured dolphins last year the animal has been wowing visitors on the lake. Capt Rue, 42, originally saw the dolphin, which also has reddish eyes, swimming with a pod of four other dolphins, with one appearing to be its mother which never left its side. 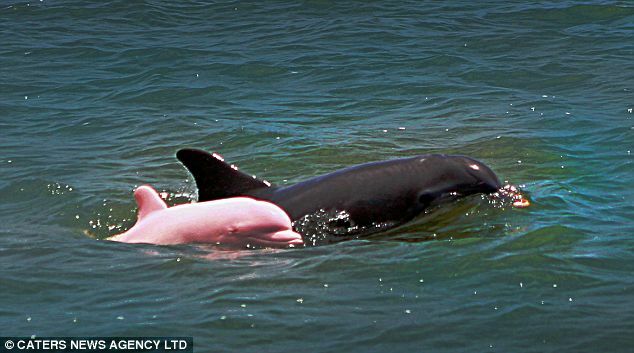 Stunning sight: The rare albino dolphin has been spotted by excited visitors to Lake Calcasieu in Louisiana. 'I just happened to see a little pod of dolphins, and I noticed one that was a little lighter. It was absolutely stunningly pink', he said. 'I had never seen anything like it. It's the same colour throughout the whole body and it looks like it just came out of a paint booth. The dolphin appears to be healthy and normal other than its colouration, which is quite beautiful. 'The mammal is entirely pink from tip to tail and has reddish eyes indicating it's albinism. The skin appears smooth, glossy pink and without flaws. I have spotted it about 40 to 50 times in the time since the original sighting as it has apparently taken up residence with its family in the Calcasieu Ship Channel. The striking mammal is thought to be the world's only pink bottlenose dolphin. Capt Rue added: 'I feel very fortunate to have seen this incredible mammal and lucky to be able to work and live in the area where such a fantastic creature frequents. 'Our guests are always thrilled at the opportunity to spot such a unique mammal and we look forward to it being around for some time to come.' Regina Asmutis-Silvia, senior biologist, with the Whale and Dolphin Conservation Society, called the dolphin 'truly beautiful'. 'I have never seen a dolphin coloured in this way in all my career', she said. 'While this animal looks pink, it is an albino which you can notice in the pink eyes. Albinism is a genetic trait and it unclear as to the type of albinism this animal inherited. 'It is a truly beautiful dolphin but people should be careful, as with any dolphins, to respect it. Observe from a distance, limit their time watching, don't chase or harass it."